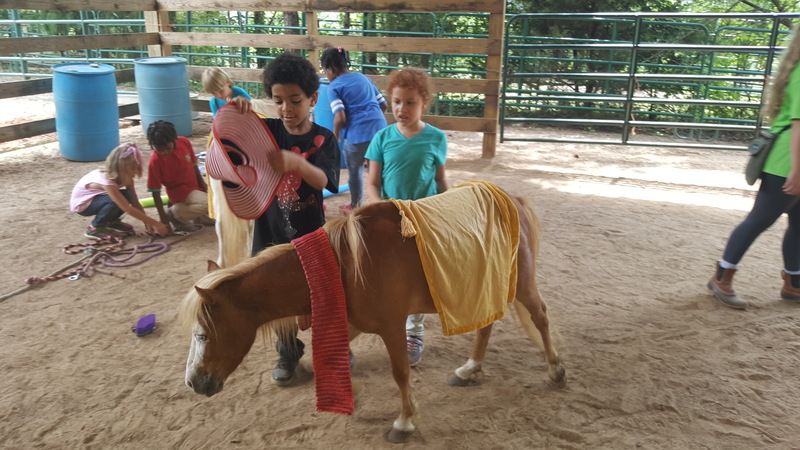 The PEACH Pit and Spirit’s Quest partner to provide equine-assisted psychotherapy, learning sessions, camps and demonstrations in Middle Georgia. Paige Jobe of Spirit’s Quest, second from left, and Gwendolyn Coley of The PEACH Pit, in green, discuss equine-assisted psychotherapy with the Georgia Post Review team. Click image to play (28:22). This entry was posted in EAP, The PEACH Pit General and tagged animal therapy, EAP, Equine-assisted activities, equine-assisted psychotherapy, Fort Valley, horse therapy, PEACH Pit, Spirit's Quest, veterans. Before summer officially began, activity at The PEACH Pit began heating up. Campers work on relationship skills during an EAP session at The PEACH Pit in Fort Valley. First, we partnered with Spirit’s Quest to co-host an eight-week Peach-Quest Social Skills Summer Camp for 20 school-age clients in Peach and Crawford counties. Camp activities focused on eight *power tools: respect, responsibility, relationship skills, boundaries, empathy, choices and consequences, and personal ability. 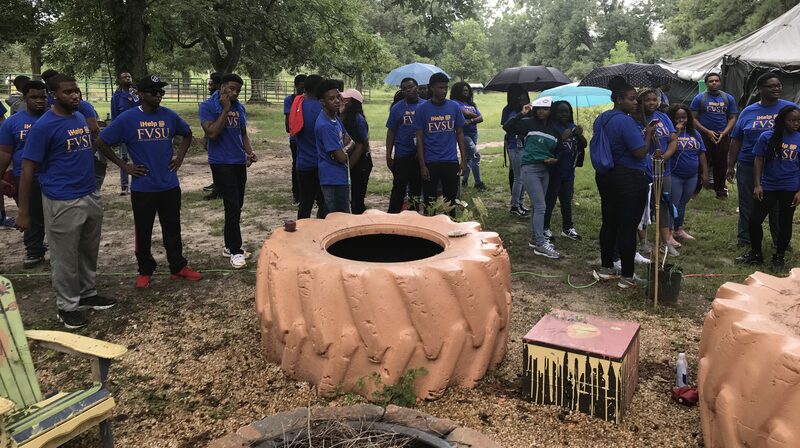 The PEACH Pit also hosted almost 200 students of the Fort Valley State University freshman class for a day of service, and we partnered with volunteers of WellCare Health Plans to help manage the activities. Many campers had never encountered any of the camp offerings, and some had never attended summer camp. 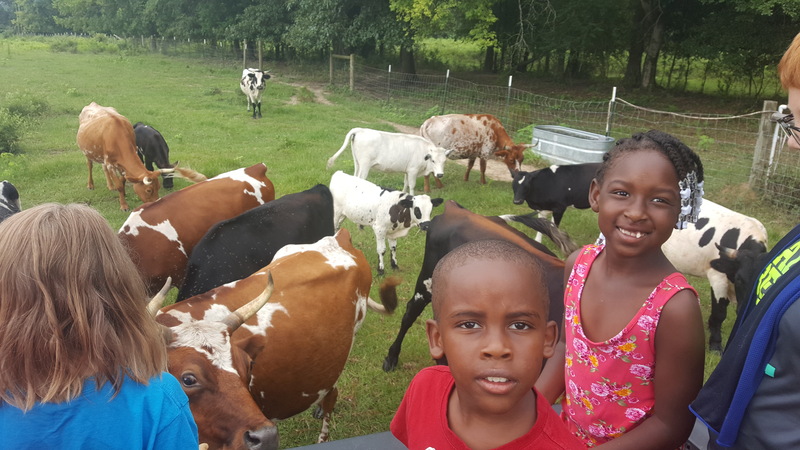 Campers learn about heritage cows at Spirit’s Quest in Roberta. 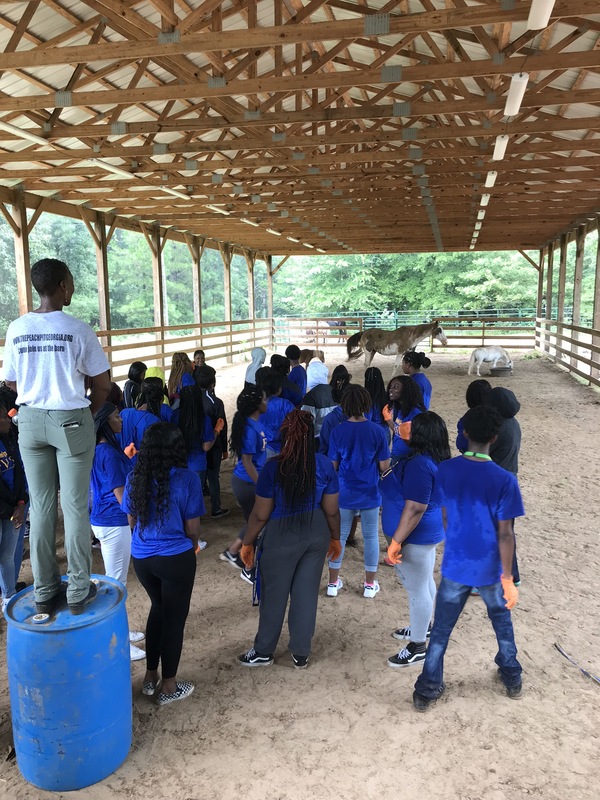 While the camp offered fun activities, the primary activity was equine-assisted psychotherapy, horses incorporated into daily group therapy sessions focusing on one power tool a week. Based on weekly surveys from parents and guardians, the camp met its primary objective: to provide children with foundational social skills that would help them be productive members of society. From the surveys, 21 percent of parents or guardians reported being “very unsatisfied” with their child’s behavior in the areas taught during camp. “Very unsatisfied” was the lowest possible ranking on the survey. Thirty percent reported being “somewhat unsatisfied” with their child’s behavior before camp. After the power tools were taught, at least 50 percent of parents and guardians reported being satisfied with their child’s behavior, with about 15 percent reporting being very satisfied, the highest possible ranking. The biggest shift in parent satisfaction with their child’s behavior was with respect. The results showed 63 percent reporting being unsatisfied or somewhat unsatisfied before camp. After the week of respect discussion, all parents and guardians reported being at least satisfied with the behavior in this area. WellCare volunteers and The PEACH Pit board members erect one of two tents. Another notable shift was with boundaries before and after camp. Before camp, half of parents and guardians reported being somewhat or very unsatisfied with their child’s behavior with boundaries. After camp, that number changed to 75 percent who were at least satisfied. The FVSU Day of Service, coordinated with the iHelp Center, was Aug. 17, the final day of New Student Orientation Week. FVSU freshmen await station assignments during their day of service. Students arrived on two charter buses and wore T-shirts on their school colors of blue and yellow, with “iHelp FVSU” emblazoned on the front. WellCare volunteers were in orange-and-white T-shirts, making for a very colorful day, despite rain showers. FVSU learn about EAP sessions while waiting out the rain. 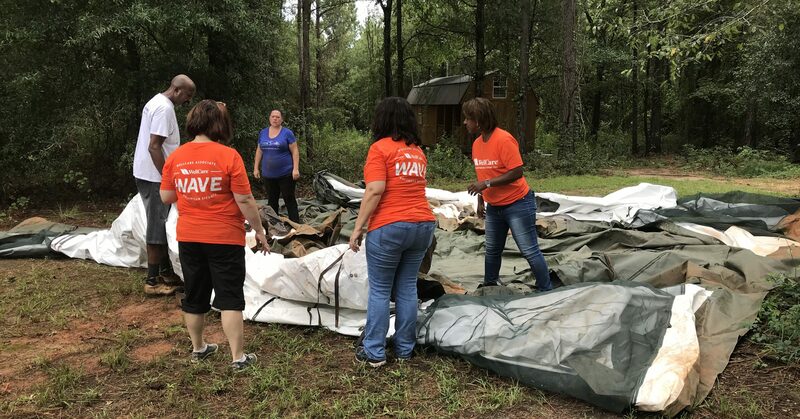 The rain dampened efforts to complete the planned activities – including erecting two tents, clearing overgrown brush, caring for the horses, stacking hay bales and erecting fencing. However, 10 dedicated FVSU volunteers and WellCare volunteers joined board members of The PEACH Pit in completing one tent. Other volunteers were able to participate in two demonstrations of how horses can help clients in counseling. Before summer ends, The PEACH Pit will host first responders for demonstrations on how they can put themselves first in getting mental health care, and we’ll be preparing for our third Horsepower and Heroes Retreat for women Veterans. Stay tuned for more busyness at The PEACH Pit. *We adapted concepts from “Power Tools for Living” by Robert and Nancy Magnelli; and “Head ’Em Up, Move ’Em Out” by Susan Jung. All are activities are based on the Eagala model of psychotherapy. This entry was posted in EAP, The PEACH Pit General, Volunteer Day and tagged EAP, Equine-assisted therapy, Fort Valley, Fort Valley State University, FVSU iHelp Center, giving back, Phoenix Center CSB, summer camp, volunteerism, WellCare Health Plans. Hey exercise enthusiasts, have you ever said, “Thank you for your service”? Well, here’s a chance to truly thank our Veterans and active duty servicemembers. The Horsepower and Heroes Heavyweight Hack is your chance for a great day of working out while raising money to bring Veterans to The PEACH Pit for a free two-day retreat. All (that’s 100 percent ) of the proceeds will go to fund The PEACH Pit’s Horsepower and Heroes Retreat on Nov. 10-12, 2017. This fundraiser will include team and individual workouts of the day, with prizes to the Top 3 teams and Top male and female. Registration is $160 per team (two men and one woman per team), and $45 for individual competitors. Additionally, proceeds from T-shirt sales will help fund the retreat. Register by 10 p.m. April 30 and get 5 percent off (code HAHX). Why are we doing this? Well, it’s our way of giving back. Our primary goal at The PEACH Pit, founded by a Veteran, is to provide affordable, low cost mental health counseling to all clients, especially our living heroes, our Veterans and servicemembers. Sadly, a 2016 Department of Veterans Affairs report indicates that about 20 Veterans commit suicide daily. We want to do our part to prevent those deaths. To that end, The PEACH Pit is selecting Veterans from a pool of applicants for the free two-day outdoors retreat at our farm site in Georgia. The fundraiser was the idea of The PEACH Pit board chair’s son, a CrossFit enthusiast and Army helicopter pilot. By the way, a hack, in horse terms, is a short trail ride, generally at a leisurely pace. In nonhorse language, it’s an efficient way of achieving a goal. You’re the heavyweights, we have the horses and the goal is to raise money. Register today for the Horsepower and Heroes Heavyweight Hack. If you know of a Veteran interested in attending our Horsepower and Heroes Retreat, have them check out that event. Thanks for helping us thank them. This entry was posted in EAP, Fundraisers, The PEACH Pit General and tagged CrossFit, Equine-assisted therapy, Fort Valley, fundraiser, giving back, veterans, weightlifting.